Jose Mourinho’s Manchester United welcome Arsene Wenger’s Arsenal to Old Trafford on Saturday in their Premier League encounter - Here's how they line up. The Gunners go into this match with a nine game winless streak against the Red Devils away from home. In fact they have lost seven out of the last nine matches, meaning they have only managed to draw two in the Premier League. 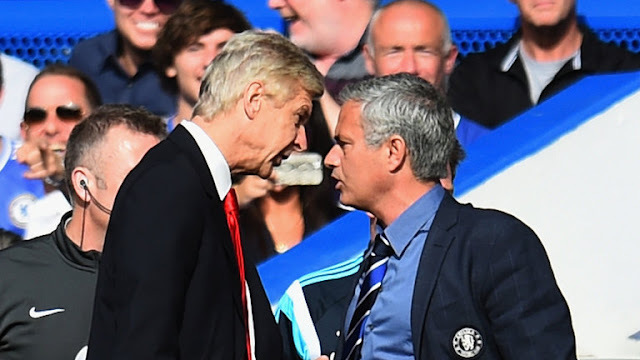 Former Chelsea boss Jose Mourinho will have plenty of confidence going into this match, as he has never lost a Premier League game against Arsenal, winning five and drawing six of his 11 previous meetings with the Gunners. Arsenal have lost just one of their last 21 top-flight matches, but Wenger has only beaten Mourinho once in their 15 encounters on the sideline. The Portugese’s only loss to the Frenchman was in the 2015 Community Shield, when the North London side beat the Blues. In team news, Manchester United will be without Zlatan Ibrahimovic as he is serving a one-match ban, while Luke Shaw, Marouane Fellaini, Antonio Valencia and Wayne Rooney are all injury doubts. Arsenal will be missing Right-back Hector Bellerin and his Spanish counterpart Santi Cazorla who remains out with an Achilles problem. Manchester United: De Gea, Valencia, Jones, Rojo, Darmian, Herrera, Carrick, Pogba, Mata, Martial, Rashford.